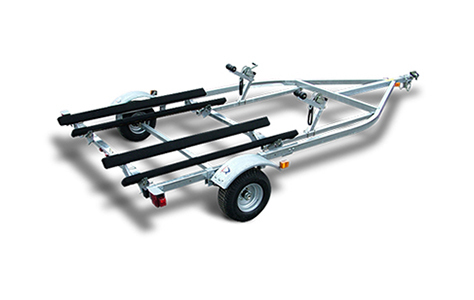 Our aluminum PWC trailers provide heavy-duty performance with the weight-saving benefits of the industry’s finest extruded I-beam aluminum frame construction for hauling up to two PWCs. Our patented I-beam construction provides exceptional strength and durability. Concealed U-bolts and appealing graphics create a trailer as good-looking as it is strong. Carpeted, fully adjustable bunks safely cradle any PWC. Stylish diamond-plate fenders and dual winchstands pair well with like LED lighting and aluminum wheels to make this model line stand out from all the competition.